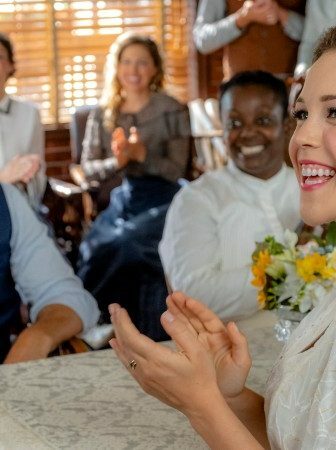 On this Heartland episode, we got treated to a return of several major characters. As well as to Borden family camping trip and a few more interesting storylines. What were they? 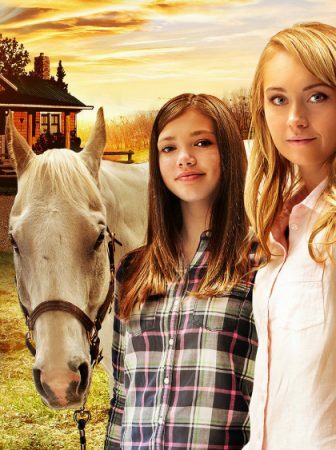 Continue reading this Heartland season 12 episode 4 recap and find out! 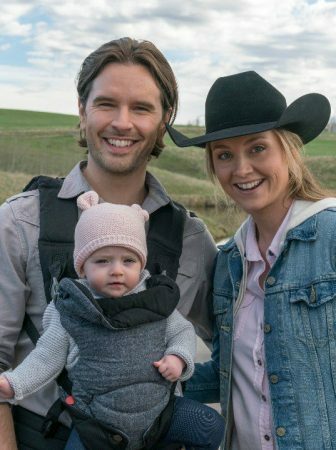 This Heartland episode saw the Borden family go on their very first family camping trip. However, as with most trips involving Amy and Ty, this one also didn’t quite go according to plan. A fact that Amy very self-awarely pointed out to Ty as they were getting ready for their trip and Ty was telling his wife their jam-packed schedule for the trip. It started out fine. A client of Ty’s lent him an RV, Amy packed the up the food and Lyndy, and they were on their way. However, when after a few hours of driving they decided to stop and stretch, Lyndy pointed her little finger at a dog that was lying not far from where they’d stopped. Ty went to investigate and sure enough, the little pup was injured. So, Ty and Amy decided to treat the dog before they got back on the road. But once that was done and they’d stopped to ask the local authorities if anybody had reported the dog missing, they were well behind Ty’s well-planned schedule. Moreover, once they got to their chosen camping spot, Amy and Ty managed to char their hamburgers, almost lose the puppy and sleep through the sunset that they so desperately wanted to watch. But despite all that the camping trip wasn’t a total bust. At the end of the day, Amy, Ty and Lyndy got to spend some quality time together. Lyndy got to see her dad save a dog. The new family got to enjoy a beautiful morning with some grill-cooked pancakes. And even managed to return the dog to its owners. I absolutely adored that they decided to go for such a simple arc for the Borden family this episode. Because it felt not only realistic but also oh-so-organic to the characters. Back at the ranch, Georgie was training hard for her upcoming show jumping event. And since she had to juggle preparing for the show, adjusting to a new coach, working at Maggie’s and hanging out with Jade and her dad who both were back in town, let’s just say Georgie was feeling pulled in too many directions. And she combated this feeling with concentrating on just one thing – show jumping. After reading an article on her new coach Kim, where Kim had said that the rider had to be just as fit as the horse to succeed. And after Kim making it clear to Georgie that she’s only interested in coaching the top jumper, Georgie dived head-first into training. Which included skipping the desert and 6 a.m. runs. Yet when she still placed second in the competition, Georgie was quite upset. Luckily, Peter was there to support her. And Georgie also had Jade to focus on. More on that later. However, I have a feeling that this lifestyle change will come up in one of the future episodes. Because we all know that most Olympic athletes not only train hard but also follow a strict diet and exercise schedule. 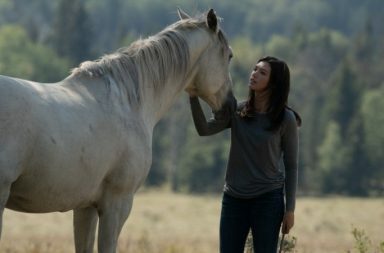 Therefore, I’m interested to see how Heartland will handle that and if it will become a bigger storyline down the road. 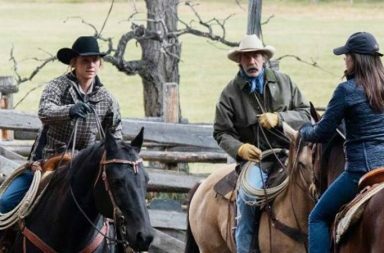 While the third major plot point of this episode had to do with Tim’s rodeo school and subsequently with Jade and Caleb, the first being Tim’s protégé, while the latter – his business partner. 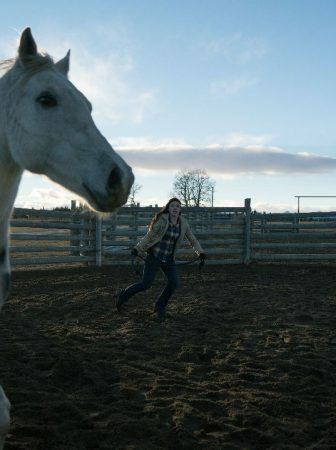 Heartland season 12 episode 4 began with Jade getting bucked off a horse. One that Caleb thought was too dangerous for Jade to train on, but Tim thought would be just the challenge she needed. But, unfortunately for Tim, Caleb was right, and the horse bucked off Jade hard, resulting in a concussion. And it left Tim at odds with both Jade and Caleb. Since Caleb was the one whose opinion Tim disregarded, and it had such severe consequences, Caleb confronted Tim about it. Tim only made it worse with not being able to admit when he’s wrong. So, Caleb decided to quit being Tim’s partner at the rodeo school. And he did it in a most Caleb way possible. By asking Jack to give Tim back a box full of Tim-related mementoes that Caleb had kept. And that along with some advice from Jack that Tim and Caleb really want the same thing – to prepare Jade and the rest of their rodeo school students ready for the real world, made Tim realize that he shouldn’t have treated Caleb the way he did. Tim apologized, promising to work together as partners from now on, and the partnership was back on. I loved how this storyline highlighted Tim and Caleb’s relationship. As well as showed how much Caleb really idolizes Tim. It gives depth to Caleb’s character. And shows Tim in a new light as well. 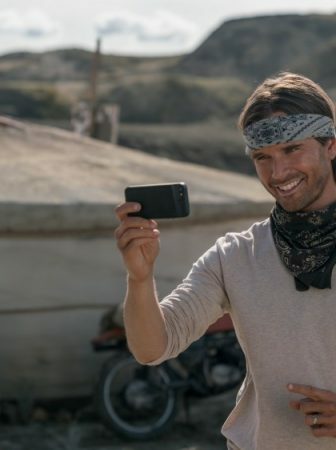 So hopefully we will be seeing more Tim and Caleb storylines this season. Meanwhile, Jade was struggling with her own consequences from the fall. Although she was experiencing quite severe concussion symptoms and both Tim and Georgie advised her not to, Jade still wanted to compete in an upcoming rodeo. But, while she was on her way to where the rodeo was held, she realized something. Depending on how severe her concussion is, she might not be able to compete ever again. So, Jade called Georgie for help. Georgie dropped everything and came to Jade’s rescue. She not only helped convince Jade that it was okay to be scared but also went with Jade to her doctor’s appointment. And as it turned out, she really did have a concussion. One that sidelines her for several months, meaning that she will miss the rodeo season and the possible payday or scholarship that it could bring her. And since Jade also turned down Tim’s offer to mentor some of the younger kids at the rodeo school, believing that her abilities were the reason for her fall, it looks like this season Jade will have some real struggles to work though. Let’s hope that by the end of the season we will see Jade in better spirits than she was this episode. Finally, how about those Peter and Jen interactions this episode? Was there really a spark between these two characters? Or am I just imagining things? At the start of the episode, we saw Peter getting some pie at Maggie’s where Jen was manning the counter being that she is Maggie’s manager. And the two of them bonded over Lou’s constructive feedback since Peter has been on the receiving end of Lou’s criticism many times. While Jen just got a performance report from Lou, in which Lou criticized Jen’s lack of assertiveness. Then later Peter admitted to Jen that with Katie being in New York with Lou and Georgie being so busy he didn’t quite know what to do with himself. So, Jen offered him to stay at the diner for a little longer and enjoy some pie. The exchange seemed a little flirty. And, although I wouldn’t sound the new couple alert just yet, you never know. I could see Peter and Jen in a relationship. What about you? Side Note: Want to know more about the actress behind Jen? 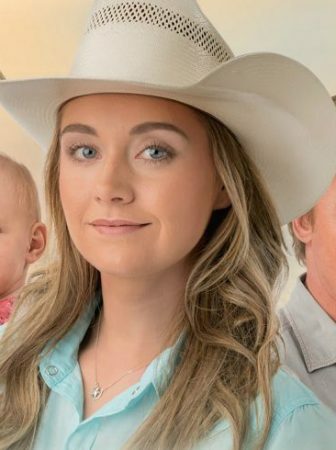 Then click here and check out our interview with Lisa Durupt, who plays Jen on Heartland! 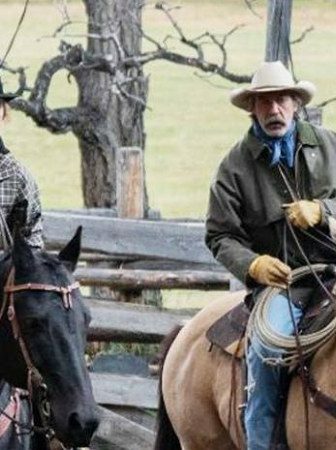 And I will end this Heartland season 12 episode 4 review with mentioning how much I loved the conversation between Peter and Jack. Peter asking Jack about raising Marion and Jack telling him to find a common interest with Georgie. That was not only great advice. But also, a very nice but sadly rare bonding moment between the two men. Let’s hope for more interactions between Peter and Jack. As well as Peter and any other character that’s not Lou and Georgie. Peter and Ty, maybe? That would be great to see! In regards to the Jen and Peter stuff, I don't think you're imagining it, or if you are, I am too. 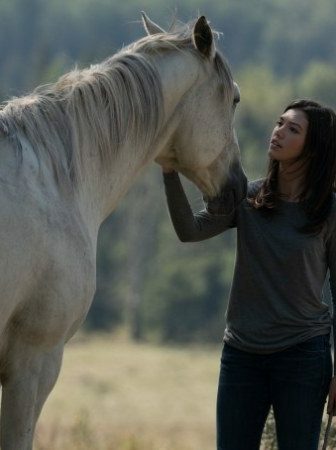 In season 11, I think it was the one where Katie was on her horse and went missing. Peter was lamenting the fact that he wasn't connecting with Katie, and Jen gave him some advice. I could definitely saw some real chemistry between the two of them. Also, I think it was the same episode, at the end there was some kind of bbq, and there was a shot of Jen giving Peter a very interested look. 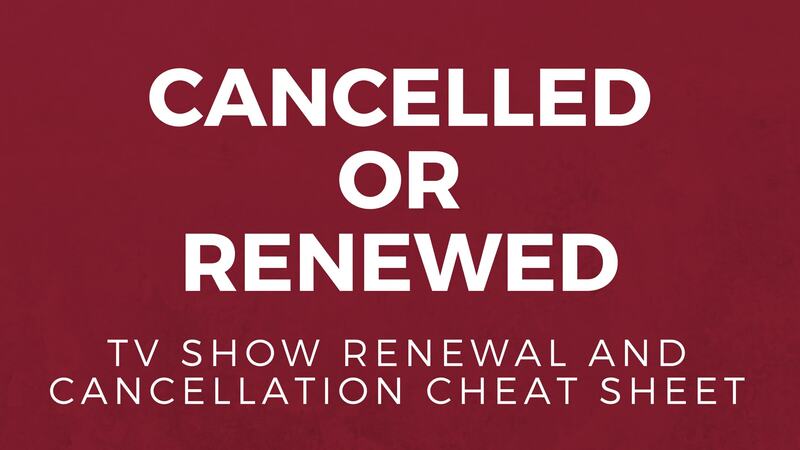 I thought something might come of it last season, but didn't. I thought I was just imagining it. But now I think they were setting something up. If something happens with them this season, I wouldn't be surprised. I'd be all for it, personally. I think they'd make a nice couple, definitely some chemistry there. Anyway, let me know if the episode I mentioned wasn't the one I was thinking of. Glad it's not just me! And I totally agree, Jen and Peter would definitely make a nice couple!